Most of the people who owned a NES growing up have probably played or heard about the NES classic Mike Tyson’s Punch-Out!! Which has received praise almost everywhere for its unique style of gameplay and its entertaining characters. Punch-Out!! Isn’t as much of a fighting game as much as it is a mix of the puzzle and rhythm genres. You have to figure out the patterns in your opponent’s movements and dodge each punch a correct way, leaving your opponent open for Little Mac (you) to get some punches in. There was a 15 year gap in-between Punch-Out!! 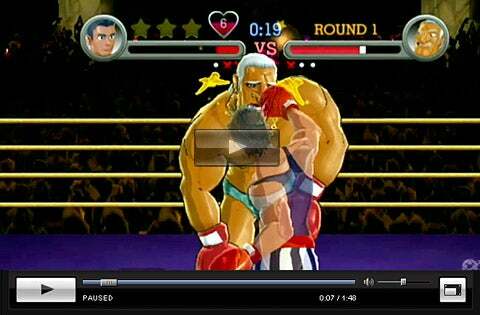 on Wii and its previous title, Super Punch-Out!! for the SNES. Fans of the original games were excited to hear of its return on Wii, and Nintendo delivered. There are a few different control schemes to use; one being a Wiimote held sideways and used in a somewhat similar fashion to other Punch-Out!! games; another being a wiimote/nunchuck combo that uses motion control for punches, which works surprisingly well. There is a last control scheme; it is using the Wii balance board for dodging punches. I have yet to try this but it looks hard to use along with the Wiimote. Almost every opponent in Punch-Out!! Is from a previous game with the exception of one, Disco Kid, who is a newcomer to the series. The fighters are over-the-top cartoon characters that employ some of the biggest stereotypes of the area of the world they are from; something you will notice pretty quickly. You start in the minor circuit, and work your way up to the champ in the circuit you are in, all the way through three different circuits with a total of 13 fighters. But wait, there’s more! After the main game you can compete in “title defense” mode, where you have to defend your title from every opponent in main mode and the opponents are much, much harder. This essentially doubles the game content. There’s also a 2-player mode, and it’s fun for a while but is ultimately ruined once someone figures out how to dodge giga mac’s punches, making matches drag on and almost always end in decision. I would still highly recommend giving it a try since it’s fun while it lasts. When I played Punch-Out!! in 2009 when it was released I thought the graphics looked great, however now they look a little dated when compared to any of Nintendo’s latest work. The music is good; most of it is just an updated version of the NES tune, which isn’t a bad thing as it’s a great theme. 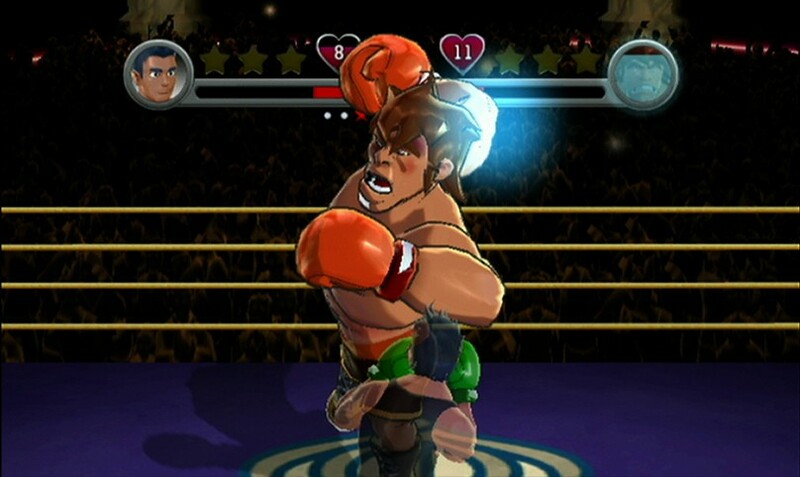 Nintendo played it safe with the music, and there’s nothing wrong with that, especially because Punch-Out!! fans would have been furious if the theme wasn’t the same. The time it will take you to beat this game entirely depends on how long it takes you to recognize the patterns and how to dodge them. It could take you from 2 hours to 10 hours to beat the main game, and then there’s title defense, which doubles the content and more than doubles the game time since it is much harder. Punch-Out!! veterans will have a bittersweet taste left in their mouths after beating this Wii reboot. While it’s a great reboot, a lot of fun, and has entertaining characters, after beating it I was left wanting more. Plus the main game seems a little easy compared to the NES original; although title defense gets a spike in difficulty. It’s the only time Glass Joe has ever been hard to beat. The last thing is that the broken 2-player is very disappointing. Still, $20 on the Wii U eShop is a great deal for this reboot. You’ll enjoy it, veteran or not. Main Cons: Broken 2-player, graphics starting to look dated. Great review dude, and thanks for the awesome content that you always massage our eyeballs with! Great review, the score seems fair too. Punch-OUT! !, eh? I might consider it. When is NA going to get another Wii title on the Wii U eshop?! Rukiafan wrote: When is NA going to get another Wii title on the Wii U eshop?! No, NA only got three in January and that was all we got. No this was the first week we've received another Wii game through the Wii U eshop since January.